Planning the perfect surprise is one of my favorite things, especially for those who are not easily surprised like my husband. So this year when I began to think of what to do for his birthday, I knew I wanted it to be something different that he wouldn&apos;t be expecting. Now, as the thrifty girl I am, you must know that I am a daily Groupon checker. Groupon truly is a great way to find some awesome deals on things in Hendricks County and Central Indiana. Well in April, the perfect deal was presented to me for my hubby&apos;s birthday, "The Rusty Wallace Racing Experience" at Lucas Oil Raceway in Brownsburg, Indiana. This experience promised hands-on, high-speed, adrenaline-pumping NASCAR racing, which seemed like the perfect fit for my speed-loving husband. Not only was this experience coming to Hendricks County but one of the dates they were offering happened to be right on my husband&apos;s birthday. Most importantly, the Groupon offer was half off the original price! 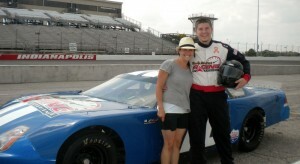 The day finally arrived for Andrew&apos;s big surprise at Lucas Oil Raceway. We were offered insurance for $60 more, which we accepted. (After all, without insurance the liability was $15,000.) Andrew was ushered up to the media suite at the track where for about 45 minutes he was taught the ins and outs of driving a stock car. You could sense the excitement as well as the nerves for the men and a few women participating in the experience. After all, they were all informed that they would be going about 140-150 mph! After the class, all attendees were taken down to the infield where they were fitted with a racing helmet and suit. There were two groups going out, those in ride along with a professional driver, and those in the racing experience who would be driving the stock car themselves. Andrew was in the last group from his class to go, so we did wait a while for him to drive but it was great watching everyone else take their turns. When his time finally came, he got his long legs through the number 17 car window. They checked his car, and he was off for his 15-lap experience. 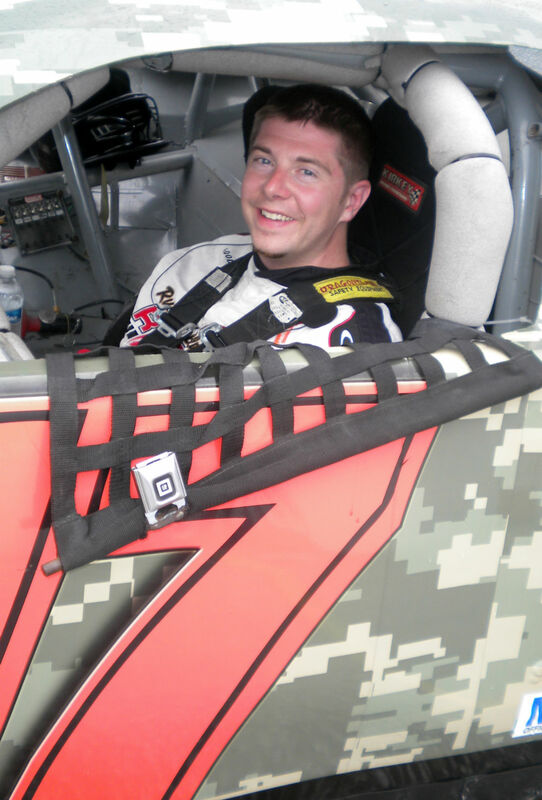 I held my breath, watched and videotaped in the infield as he raced around the track like an expert. But about 5 laps in, I noticed him coming off the track into the pits. Evidently, he was getting a flat, and they told him through his head set. So not only did he get to drive but he also experienced a pit stop! In no time, he was back on the track, and before I knew it, the checkered flag was being waved. As he came back to park his car, I couldn&apos;t help but notice the look on his face. Getting out of the car he even gave a whoop and a wow! He loved it...mission accomplished! I would recommend The Rusty Wallace Racing Experience to anyone, and to get to experience it at Lucas Oil Raceway, a historic old track were legends in the sport have raced, made it even more special! For those of you who have a speed demon in your life like me, I would highly recommend it as a gift! It was well suited for a wide variety of ages. Andrew&apos;s class included ages 18 all the way to 80. The Rusty Wallace Racing Experience will be back at Lucas Oil Raceway July 13-15 and then again August 8-9. For more dates and information, visit this website. Also, be sure to keep your eye on Groupon for another deal like the one I found! Ladies and gentlemen START YOUR ENGINES!